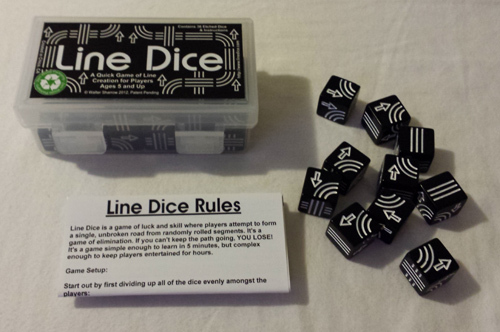 Line Dice is a game designed by Walter Sharrow, published by World Wide Chaos, Inc.. It is for 1-6 players. In this game, players will be trying to build an unbroken path using the dice. The player that is best able to arrange the dice will be declared the winner. To begin, the dice are divided evenly between the players, between 18 dice each for 2 players and 6 dice each for 6 players. The players will each pick up their dice and roll them. Dice can not be rerolled after they’ve been rolled once. Players can then organize their dice or hide them from the other players for strategic purposes. The first player is chosen and they may place a die in the middle of the table. Play now begins. On a player’s turn, they will place a dice to add onto the path that is created. The second player’s dice is the one that determines which way that future dice must be played. Play must always continue forward and can not move backwards. In other words, once the direction has been determined, player’s must continue placing dice in that direction and can not add dice to the beginning piece moving in the opposite direction. Once a die with an arrow on it has been placed, all future dice with arrows must have the arrows facing in the same direction. Dice can not be dead ended either, that is to say a path must always be able to continue. This all continues with each player placing dice until one of the victory conditions have been met. If the other player(s) can not place a die, they lose. The last player still standing is the winner. Likewise, if a player forces another player to place a die that connects back to the beginning die and closes the pathway into an infinite loop, that player is the winner. The player that closed the path loses. The main point is that you must have a die that can be placed or you lose. This game consists of 36 black and white line dice. They come in this really neat plastic container with a double snap latch lid. The dice are really good quality and roll very easily. They are a bit loud when you’re rolling that many dice at one time though. They look really great and I rather like the design. It makes me think of Tsuro. There’s really nothing more to say than that. The rulebook is made of a thick card stock type material and folds up nice and neat to be able to fit on top of the dice inside the plastic container. I really like that it wasn’t some huge sheet of paper that wouldn’t fit inside the package. Everything is explained really well with example pictures showing how to play. Everything is in black and white except for a red X and a green check mark on one of the example pictures. There is also an extra optional rule for something called Mike’s Bluff which is considered “Honest Cheating”. There’s even instructions for solo play. All in all, the rulebook is nice and gets the job done. This game is lots of fun. It’s a really quick little filler game that can be played in about 5 minutes time. I’ve played it several times. I’ve played it with others as well as solo. It doesn’t matter how you play it, it’s fun. There’s a little bit of strategy and a bit of luck to this game. The dice rolls will determine a lot on what you can do. However, what you do with the dice is where the strategy comes in. The game makes me think a little bit of Tsuro in that you are creating a pathway that you can’t go back on. You must keep moving forward. One might even call this the Tsuro of dice games. I really enjoy playing this game and find myself breaking out the box again and again. Line Dice is a very light dice game of pathway building. It’s a great filler that plays really quickly. Fans of rolling dice and Tsuro will definitely have fun with this one. The packaging is small enough that it can basically be carried anywhere and played anywhere that there is a flat surface. This is a game that is simple to play and easy to learn. The kids will have no trouble understanding the rules and playing this one. I thoroughly enjoy playing this game and I highly recommend it. I’m certain that you will enjoy it too. For more information about this and other great games, please check out World Wide Chaos at their site. This entry was posted in Reviews and tagged board, board games, card, card games, chaos, dice, games, line, line dice, sharrow, walter, walter sharrow, wide, world, world wide chaos. Bookmark the permalink.